What Kind of Ticket Would I Need to Ride the Hogwarts Express? The massive and wildly popular Wizarding World of Harry Potter at Universal Orlando is filled with all kinds of incredible attractions, shows, shops, food, and more. Among its most compelling features is the Hogwarts Express, the themed train ride that connects the London and Hogsmeade lands and is itself an attraction. Everyone who wants to get the complete Potter experience and lose themselves in the mythical world of J.K. Rowling’s beloved books and films would want to get aboard the train. 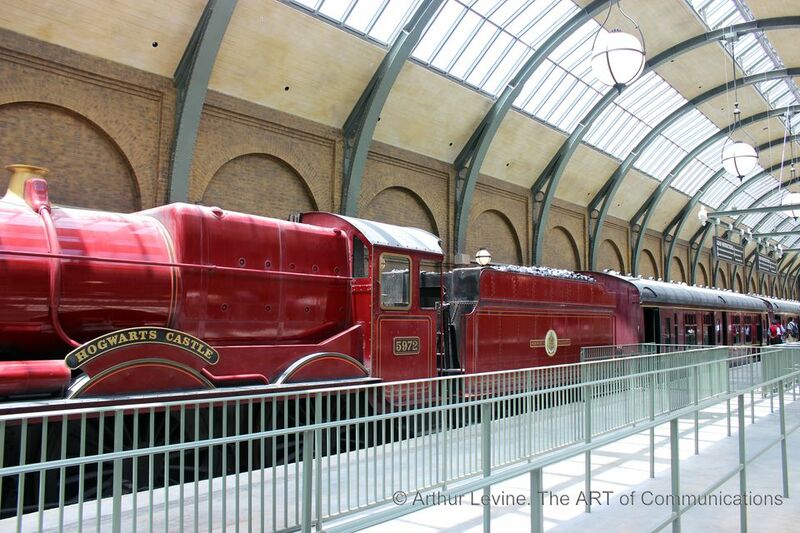 You can read our review of the Hogwarts Express to learn what makes it such a wonderful ride. Here’s the thing though: In order to enter King’s Cross Station at Universal Studios Florida or Hogsmeade station at Islands of Adventure so that they can get on the train, passengers need to have the correct ticket. Read on to learn what kind of admission passes you would want to get so that you can hop on for a ride. Universal Orlando operates three separate parks: Universal Studios Florida, Islands of Adventure, and the Volcano Bay water park. Each park requires a ticket for admission. The resort sells two basic types of one-day tickets for the two theme parks: single park admission and park-to-park admission. As its name implies, a single park pass grants admission to one of the two parks. Guests cannot leave one park and go to the other using a single park ticket. A park-to-park pass, however, allows park hopping between the two parks. You could add a single-day Volcano Bay ticket to the mix, but it’d be crazy to expect that you could reasonably visit all three parks in one day and enjoy everything they offer. Universal also makes multi-day passes available. Visitors can purchase from one- up to five-day passes. There are two kinds of multi-day passes: two-park passes include the two theme parks, Islands of Adventure and Universal Studios Florida, and three-park passes that include the two theme parks plus the Volcano Bay water park. Here is where a gets a bit tricky: The multi-day passes also come in one-park-per-day and park-to-park versions. A two-day, two-park, one-park-per-day pass, for example, would allow a ticket holder to enter Islands of Adventure or Universal Studios Florida on each of the two days, but not both parks on any one day. A park-to-park pass, however, would allow a ticket holder to go back and forth between both parks. Got it? What Does This Have to Do with the Hogwarts Express? The Hogwarts Express provides one-way service from The Wizarding World- Hogsmeade at Islands of Adventure to The Wizarding World- Diagon Alley at Universal Studios Florida and vice-versa. Since the two Potter-themed lands are located in two separate parks, Universal requires all train passengers to have park-to-park passes. The passengers are, after all, going from one park to the other. It creates a bit of confusion among guests at both train stations. Some visitors are not aware of the need for park-to-park tickets to ride the Hogwarts Express. They are able to visit either Diagon Alley at the Studios or Hogsmeade at IOA with a single park pass and experience all of the Potter attractions at either of the parks, except for the Hogwarts Express. Universal employees are on hand to check passes before guests enter either of the stations. If visitors have single park passes, they are invited to go to handy-dandy booths at the train stations where ticket sellers are only too happy to upgrade them to park-to-park tickets. Depending of the number of days purchased for a one-park-per-day ticket, the additional cost to upgrade to a park-to-park pass ranges from $55 to $60 (prices valid October 2018). Visitors with single-park tickets can fork over the extra money, get their upgraded park-to-park passes, and enter the line to get on the Hogwarts Express. If $55 to $60 seems steep to ride a single attraction, keep in mind that the additional fee includes admission to a second park and all of the attractions that it offers. In addition to the train ride, guests who upgrade to park-to-park passes would be able to enjoy all of The Wizarding World experiences at the other park as well as all of the other rides and things to do at the park. For example, Universal Studios Florida features attractions such as Transformers: The Ride 3D and The Simpsons Ride. Islands of Adventure offers great rides such as Spider-Man and The Incredible Hulk. If you only had one day to spend at Universal Orlando, would you have enough time to take advantage of everything that Universal features at both theme parks (leaving the Volcano Bay water park out of consideration for the moment)? Probably not. And that’s intentional on Universal’s part. Once you commit to purchasing park-to-park tickets, you’d likely want to spend at least two full days at the resort—and maybe stay overnight at one of its (wonderful) on-property hotels. Universal has leveraged the popularity of its Harry Potter attractions to persuade visitors to stay longer and spend more money with them. Building the two Potter lands at two separate parks was a bold move on Universal’s part. Adding a train that connects the two lands and requiring park-to-park passes to board it was even bolder and a brilliant strategy. Learn why the Hogwarts Express has change everything at Florida’s theme parks.